A while back I was browsing through a wonderful cooking blog, Chef In Training. 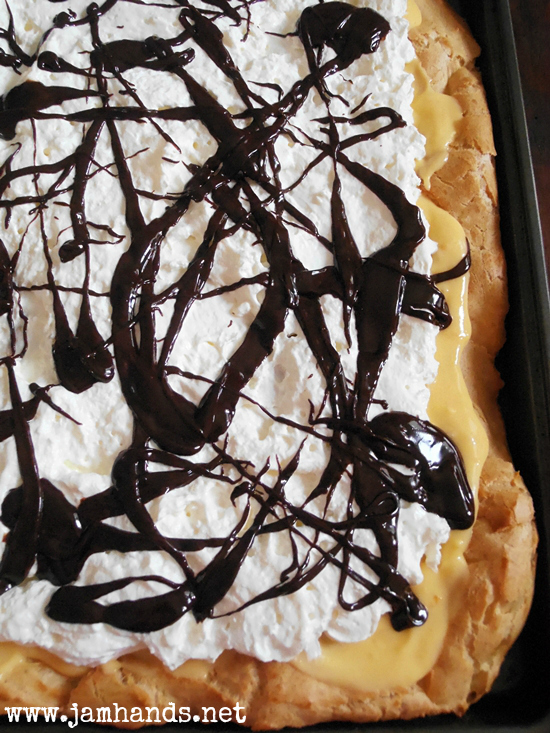 I spotted a recipe for an Eclair Cake and pinned it. 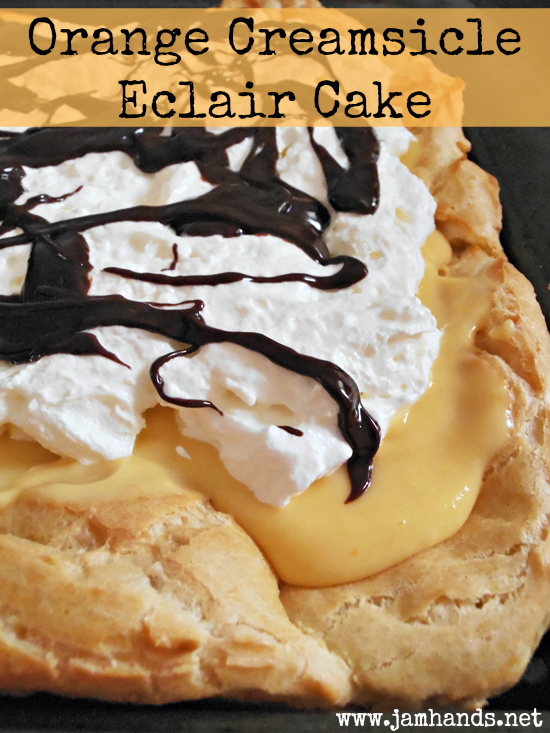 Today I wanted to share with you the spin I took on the original recipe, turning a traditional eclair cake into a delicious Orange Creamsicle Eclair Cake. The original recipe called for the filling to be made with instant pudding mix, but I made my pastry cream from scratch. If you would like to save time, by all means you could make a vanilla pudding from a mix and add in orange extract or the zest of an orange or two. I preferred to make pastry cream on my own because I love the way it tastes. While I was experimenting for this recipe, I tried making stabilized whipped cream and chocolate ganache for the topping. I have to say, if you are making this several hours beforehand and it is important that the whipped cream holds up, I would suggest using the whipped topping. If you are serving this immediately, go with some fresh whipped cream on top. If you are not a fan of chocolate syrup and would like to make a ganache, my method was to use one cup of dark chocolate chips with about 1/2 cup of heavy cream heated over a double broiler until the chocolate melts, whisking constantly. You may need to add a little bit more cream to make it thin enough to drizzle. If that is too much work for you, chocolate syrup it is! One last note: I used Orange Juice Fruit Powder in my pastry cream. It can be found here. Enjoy! 1. Boil water and butter together in a medium saucepan on stove. Take it off the heat and add the flour and sugar and mix with hand mixer. 2. Add and beat in eggs one at a time. Add in vanilla. 3. Spread in a lightly greased 9x13 or a jellyroll pan. 4. Bake at 400 degrees F for 25 minutes, the cake will not be smooth or uniform in appearance. Let cool completely. 1. Place the milk and half the sugar in a saucepan over medium heat. 2. Combine the egg yolks, orange juice powder and the remaining sugar in a bowl and whisk until light in color. Add in the flour and the salt, mix to combine. 3. When the milk just begins to boil, remove from heat. Very slowly dribble the hot milk into the yolk mixture, stirring all the time. When about half of the milk has been added, place all of the yolk mixture into the saucepan over medium heat. Using a spatula or a whisk, mix the pastry cream as it heats, making sure to reach all of the corners of the pan when you stir. Bring the mixture to a boil. Let boil for about 1 minute, stirring constantly. The mixture will be thick. 4. Remove from heat. Add the butter and orange zest. Place into a bowl and cover directly with plastic wrap to stop a skin from forming on the cream. Chill and use within a few days. 1. Spread the orange filling over the base. Top with cool whip. Drizzle with chocolate syrup. Cut into pieces and serve. Adapted from Chef In Training. Sharing this recipe at the following fun link parties. Thanks for featuring my espresso Ali! I appreciate you hosting the party and all the work that goes into it! Have a wonderful week! Oh yum - that does look just too good!! I can't wait to make your Orange Creamsicle Eclair Cake, it looks delicious. Hope you have a great weekend and thanks for sharing your tasty recipe with Full Plate Thursday. Never heard of this combination. Sounds wonderful. Thank you for the recipe. This looks great too! Love your pictures! Oh my gosh this is some dessert! Thank you for sharing this with See Ya in the Gumbo. I love eclairs--cool to have it in cake form! I've never tried pasty cream! But it looks so delicious, I think I'm inspired! It doesn't appear to difficult and the results are amazing! Thanks for sharing at One Creative Weekend! PS I have joined to follow so I don't miss anymore yumminess.